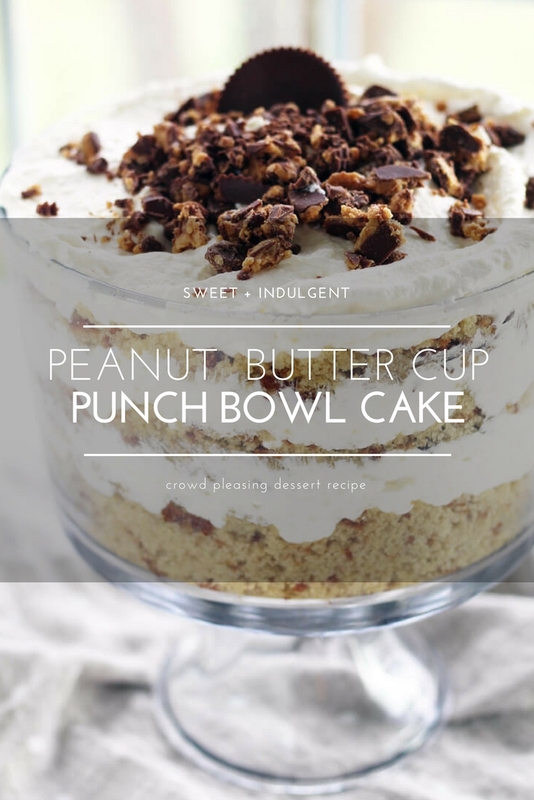 You are going to love this super-sweet Peanut Butter Cup Punch Bowl Cake. Moist layers of cake, whipped filling, and delicious peanut butter cups make this an indulgent dessert everyone will go crazy for. 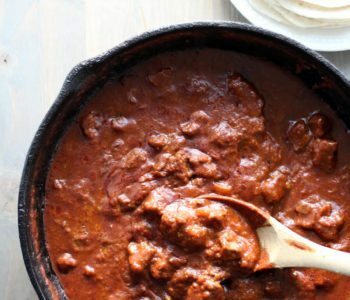 Best enjoyed with a hot cup of coffee. This is an easy dessert recipe for punch bowl cake that EVERYONE will want the recipe for. The idea came from my mom. 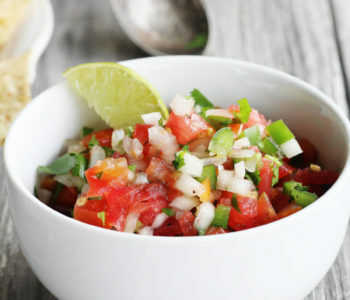 She has a similar recipe for this that gets rave results. We put a TINY little twist on her recipe for an extra layer of peanut butter cup flavor. 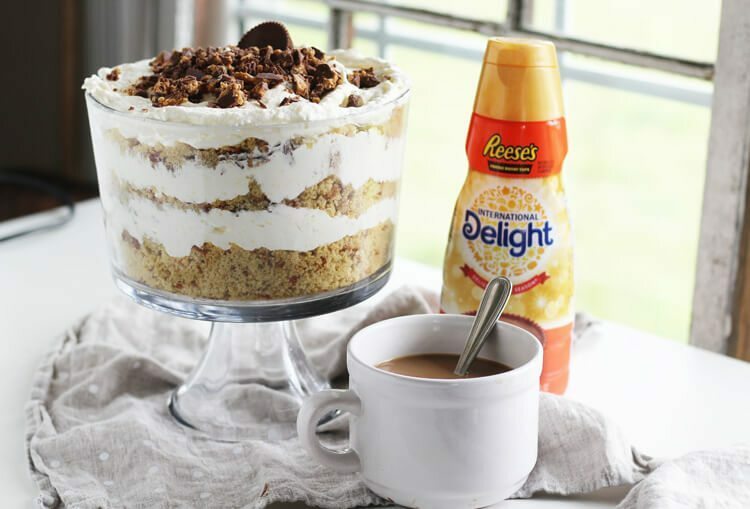 We used International Delight® REESE’S® Peanut Butter Cup Creamer from International Delight not only in our hot cup of coffee but also in our dessert. 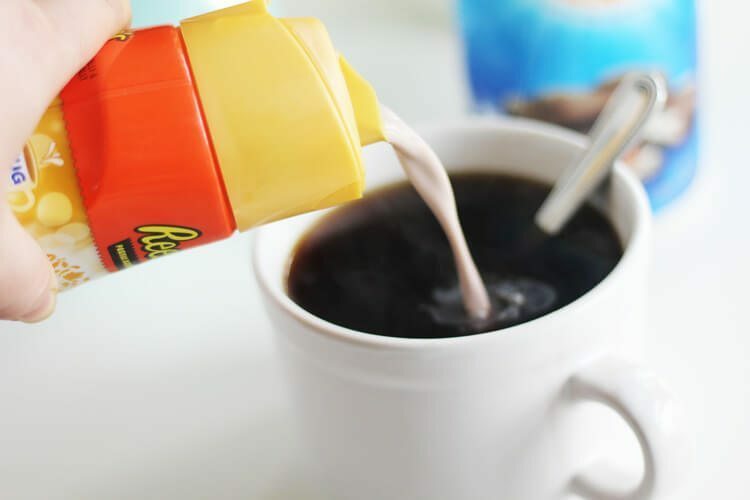 With these delicious coffee creamers, you can enjoy your favorite candy in your coffee. 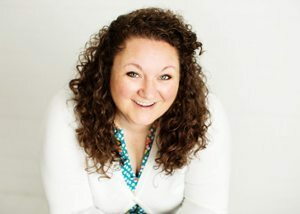 Look for two ways to save on your next purchase. First, you can save with this Ibotta offer. Then, look for Walmart In-Store displays for a tear-pad coupon for $0.50 cents off valid in April. 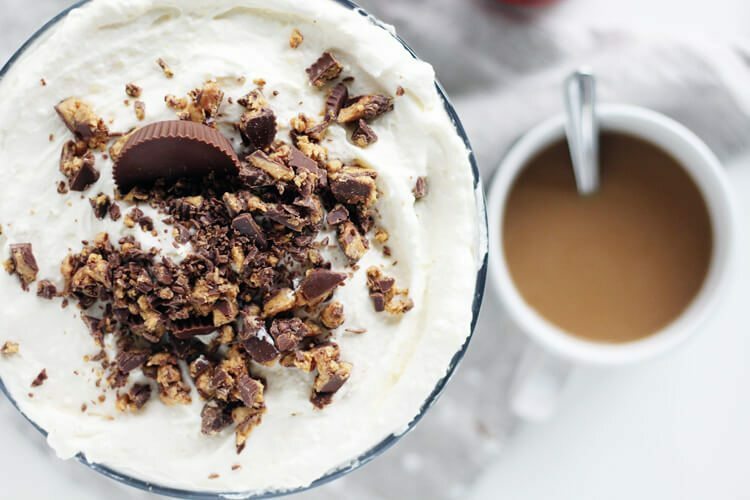 Now you can have a peanut butter cup in your morning coffee. And yes, your eyes are not deceiving you, that’s International Delight® Almond Joy™ flavored creamer, too. Here are the flavors you can pick up at your local Walmart. If you are crazy for peanut butter cups like I am, you can’t get enough of that nutty and chocolaty flavor. 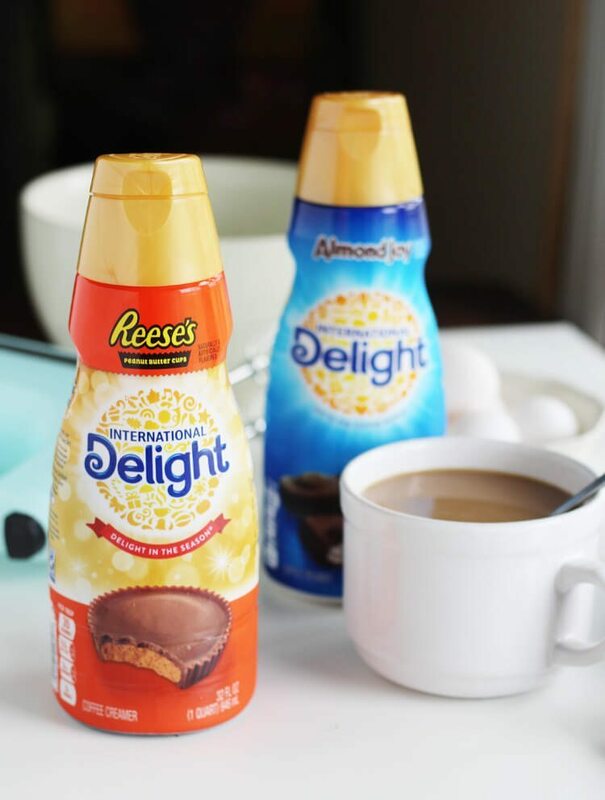 International Delight® REESE’S® Peanut Butter Cup is the perfect addition to your morning cup of coffee. 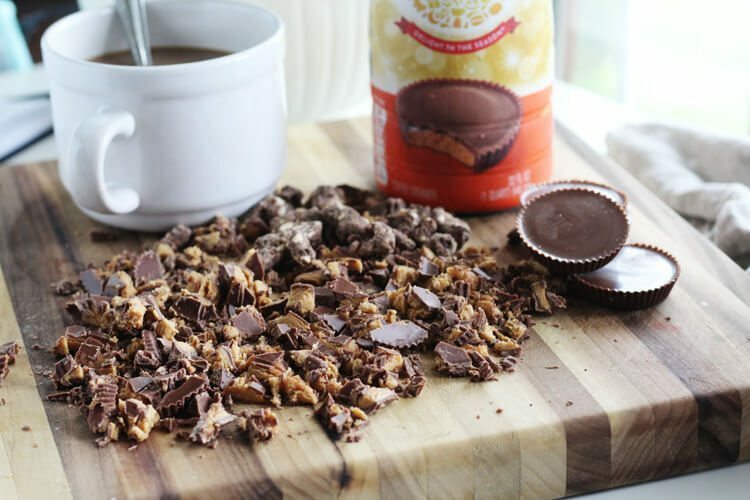 Is there a REESE’S® Peanut Butter Cup in your mug? There should be. 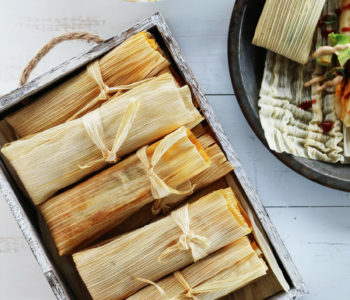 Click here to get more recipe inspiration for delicious, seasonal treats. Bake a yellow cake mix according to package directions. 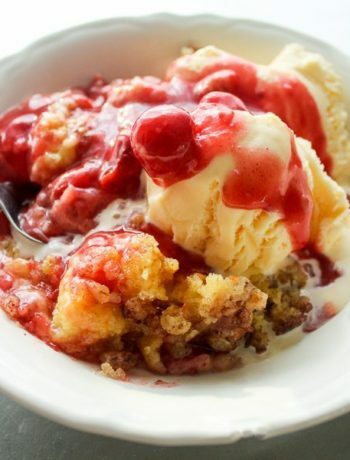 Crumble the cooled cake. Beat together egg yolks, powdered sugar and melted butter until smooth. Fold in whipped topping. 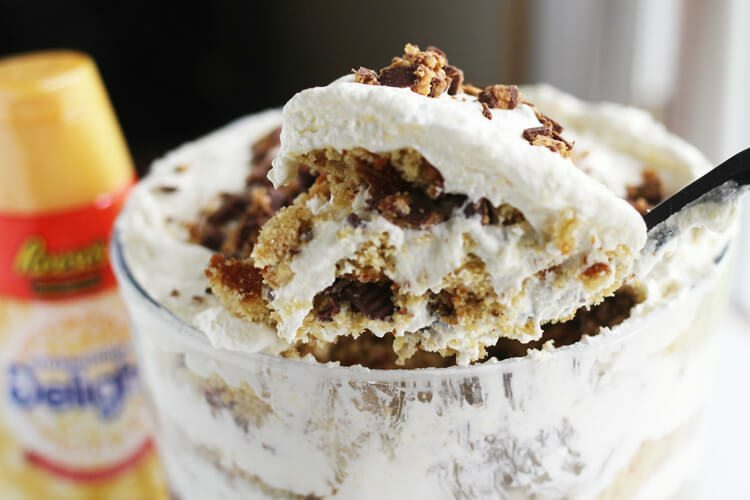 In a large bowl or trifle dish, alternate layers of crumbled cake, whipped filling, and crushed peanut butter cups. Top with a final layer of whipped topping and peanut butter cups. TIP: Instead of making your cake mix with just water, use half water and half International Delight® REESE’S® Peanut Butter Cup creamer. 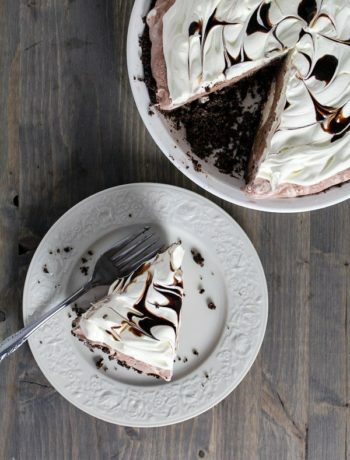 This makes your cake super-moist and gives it more of that peanut butter and chocolate flavor. This is an easy dessert recipe for punch bowl cake that you will love. 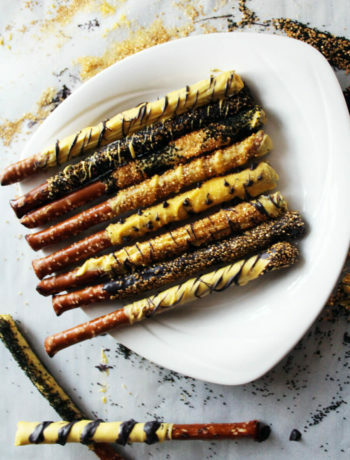 Perfect for parties, potlucks, or anytime you need a delicious sweet treat. 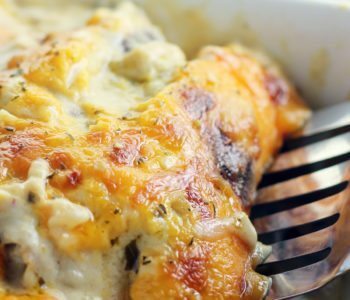 This recipe is one of my husband’s favorites, and I hope your family loves it, too. Fold the whipped topping by hand into the sugar, egg and butter mixture to keep it light and fluffy. Make crumbling the cake easy by using the large side of a box grater. Chill overnight so all of the flavors come together and the punch bowl cake is super moist. 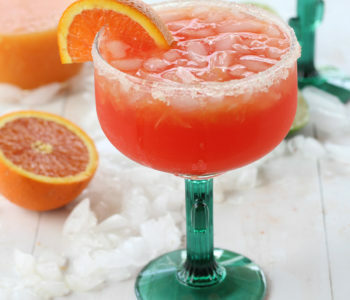 Wouldn’t this be awesome with a chocolate cake and coconut inspired by the Almond Joy™ creamer, too? 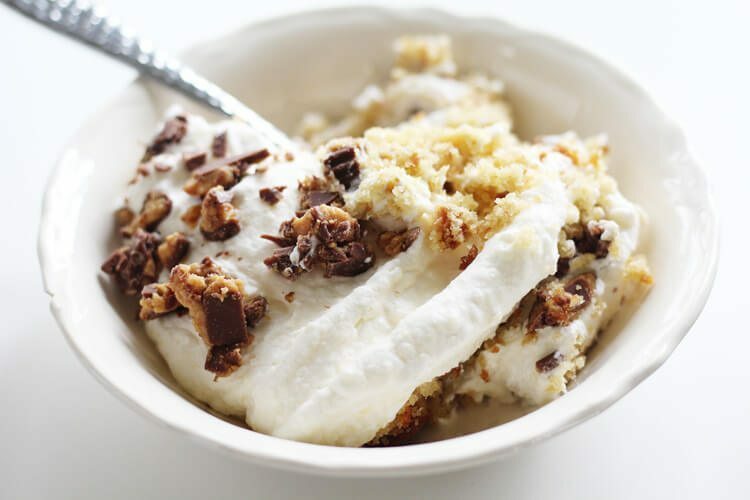 Every bite of this Peanut Butter Cup Punch Bowl Cake is loaded with sweet cake, creamy filling, and peanut butter cups. You won’t be able to resist. You are going to love this easy recipe for punch bowl cake. 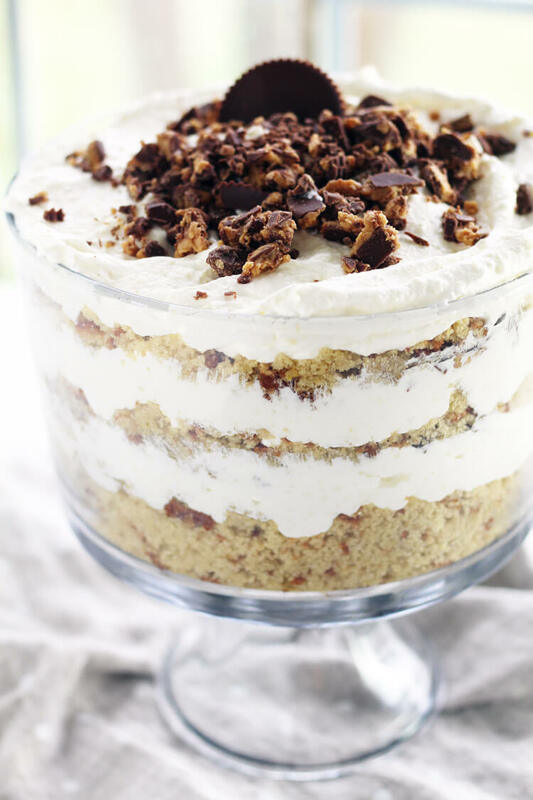 Indulgent layers of moist crumbled cake, rich whipped filling, and peanut butter cups. Everyone will want your recipe! 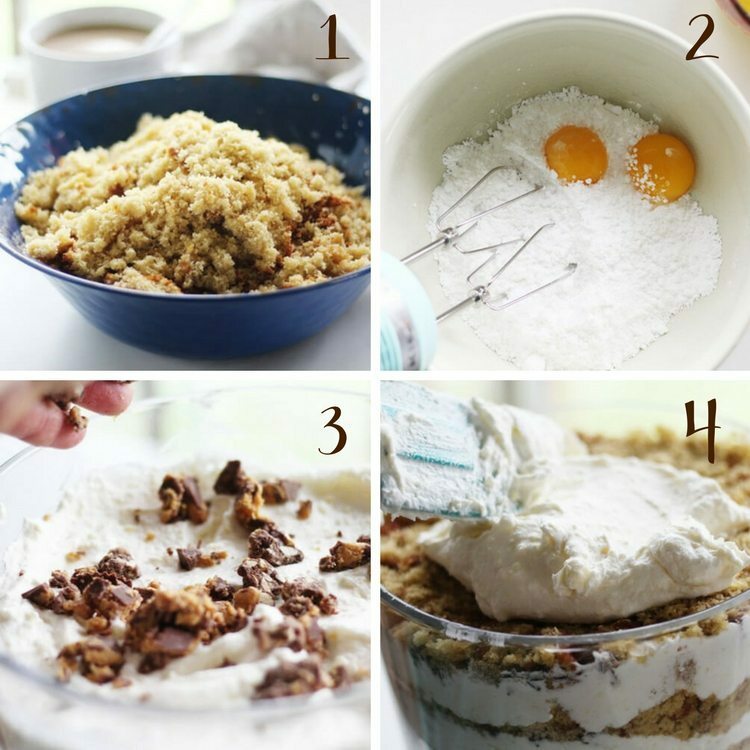 Prepare cake mix using the box mix, oil, water, coffee creamer and 3 eggs. Bake according to package time and cool completely. Crumble the cooled cake using a box grater. In a large bowl, beat the powdered sugar and egg yolks together until smooth. Slowly drizzle in the warm melted butter while beating on high speed. Fold in the tub of whipped topping by hand until combined. Chop 8 of the peanut butter cups into small pieces. Reserve one peanut butter cup to place on top. In a large clear punch bowl or trifle dish, assemble the punch bowl cake in layers. Start with a layer of cake crumbs, then top with the whipped cream mixture, and a layer of crumbled peanut butter cups. Repeat the layers, ending with a topping of whipped mixture and peanut butter cups. Press the remaining peanut butter cup into the top for garnish.